Cocoa Life is supported by all of Mondelēz´s chocolate brands. It strengthens our global chocolate business and deepens our connection with the cocoa origins. Our goal is to ultimately source all our cocoa sustainably, mainly through Cocoa Life. We've been taking steps with Cocoa Life to ensure a happy future for cocoa farmers, their communities and chocolate lovers everywhere. We have strong roots in Africa since more than 130 years and we feel deeply connected with Cocoa farmers and their communities. Together, hand in hand we grow. 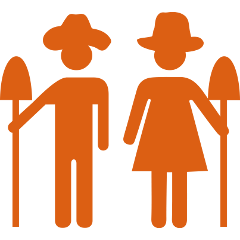 Freia is proud to be part of investing in the future of cocoa farmers and their communities. Ethically sourced cocoa and exquisitely crafted chocolate. Over the years we have learned how to make chocolate in the best way: as good as possible and produced in a responsible way. Our future is rooted in helping people enjoy life with products that are safely and sustainably sourced, produced, and delivered. That's why we're signing up to make Milka part of Cocoa Life. Creating chocolate is a long, complex process. Learn more about the many steps needed to turn cocoa beans into bars of chocolate. We believe that Suchard can bring the best quality chocolate only if we start from the chocolate heart – the cocoa bean.